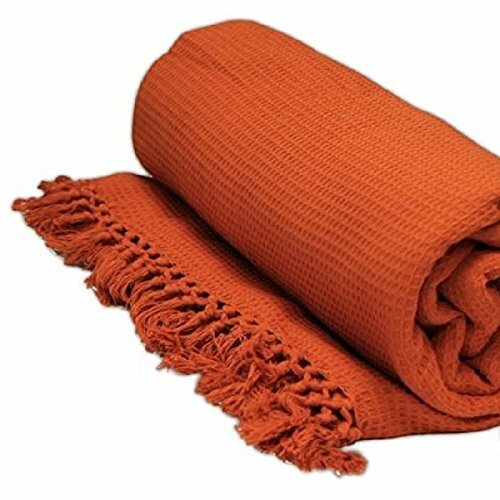 100% Cotton Honeycomb Waffle Sofa/Bed Throw, With Tasselled Edging by Viceroy Bedding (90″ x 100″, Terracotta Orange) has the following specifications Extra Soft Heavy Weight Superior Quality Cotton Perfect for the living room or the bedroom, can be used as a sofa throw or a bedspread and even as a blanket whilst sitting on the couch watching tv. Ideal for using all year round and can even be used outdoors for a picnic. Fully Machine Washable Available In 3 Sizes: – Single LARGE : 70″ x 100″ / 178cms x 254cms , which will be perfect for 1/2 seater sofa or a single size bed. – Double VERY LARGE : 90″ x 100″ / 229cms x 254cms , which will be perfect for 2/3 seater sofa or a double size bed. – King EXTRA JUMBO LARGE : 102″ x 102″ / 259cms x 259cms , which will be perfect for 3/4 seater sofa or a king/super king size bed.